Image caption Peruvian officials say access to the area is "strictly prohibited"
Peru says it will sue activists from the environmental pressure group Greenpeace after they placed a banner next to the Nazca Lines heritage site. The activists entered a restricted area next to the ancient ground markings depicting a hummingbird and laid down letters advocating renewable energy. Peru is currently hosting the UN climate summit in its capital, Lima. A Greenpeace spokeswoman said the group was investigating but its activists had been "absolutely careful". Luis Jaime Castillo, a Peruvian deputy culture minister, said Peru would file charges of "attacking archaeological monuments" against the activists from Argentina, Austria, Brazil, Chile, Germany, Italy and Spain. He said the Nazca Lines, which are an estimated 1,500 to 2,000 years old, were "absolutely fragile". "You walk there and the footprint is going to last hundreds or thousands of years," he said. The lines, depicting animals, stylised plants and imaginary figures were declared a Unesco World Heritage Site in 1994. "They haven't touched the hummingbird figure but now we have an additional figure created by the footsteps of these people," Mr Castillo told local radio. 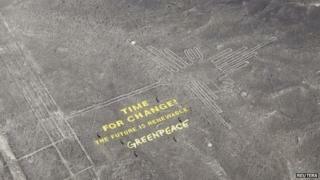 Greenpeace spokeswoman Tina Loeffelbein said the activists had been "absolutely careful to protect the Nazca Lines" when they laid out yellow letters in cloth reading "Time for Change; The Future is Renewable" on the desert ground on Monday. Mr Castillo said the Peruvian government had nothing against the message "but the end doesn't justify the means".